I’ve been a fan of John Lennon for as long as I can remember, and October 9, his birthday, has always been a special day for me. In 1983, when I was a high school junior, celebrating his birthday changed from something I simply did, by choice, into what, at the time, I considered a moral imperative. In October of ’83, I was a student — a junior — at McClellan High School in Little Rock, Arkansas, and October 9th happened to be the day that all juniors were, according to that school’s administration, required to take the ASVAB: the Armed Services Vocational Aptitude Battery. While this is a standardized test, it isn’t like other standardized tests — it is actually a recruitment tool for the United States military. Reagan made this extremely unfunny “joke” the next year, in 1984, but the climate of fear in which he thought such a thing would be funny was already firmly in place in 1983, and I was already openly questioning the sanity of our president. 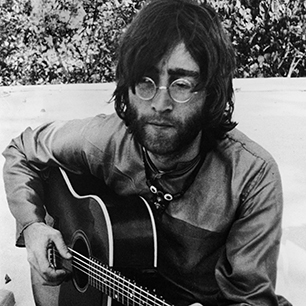 My own anti-war attitudes, very much influenced by Lennon and his music, were already firmly in place. For the few unfamiliar with it, here is a sample of Lennon’s music. So here I was, a high school junior, being told I had to take a test, for the military, on John Lennon’s birthday. I reacted to this in pretty much the same way a devout Jew or Muslim would react to being told to eat pork chops: I absolutely refused to cooperate. “Blasphemy” is not a word I use often now, and it wasn’t then, either, but to cooperate with this would have been the closest thing to blasphemy which I was capable of understanding at that age (I was 15 years old when this happened). The other juniors got up and shuffled off, like good, obedient soldiers, when the intercom told them to go take the ASVAB. I simply remained seated. The teacher told me it was time to go take the ASVAB. I replied, calmly, that no force on earth could compel me to take a test for the military on John Lennon’s birthday. At that point, I was sent to the office. Going to the office posed no ethical nor moral dilemmas for me, for I wanted the people there to know, also, that it was wrong for them to give a test for the military on October 9, of all days. The principal, a man already quite used to dealing with me and my eccentricities, knew it would be pointless to argue with me about the ASVAB. He simply showed me a chair in the main office, and told me I could sit there that day, all day, and I did. To the school, this might have been seen as a single day of in-school suspension, but I saw it for what it really was: a one-person, sit-down protest for peace, in honor of the greatest activist for peace the world has ever known. It was an act of civil disobedience, and I regret nothing about it. I will be sharing this story with Lennon’s widow, Yoko Ono, a woman I very much admire, and the greatest living activist for peace in the world today. Yoko, I do hope you enjoy this story. You and John have done great things, and they will not be forgotten, as long as people remain alive to tell about them. This entry was posted in Education, History, Life, Music and tagged 1983, adolescence, ASVAB, birthday, childhood, Education, high school, History, John Lennon, John Lennon's, Lennon, military, music, October 9, peace, protest, school, story, true story, war, Yoko Ono by RobertLovesPi. Bookmark the permalink. Thank you Robert, for sharing those memories. You were a very sophistocated and insightful young man at the age of 15. It took a lot of courage to stand up for what you believed in, when everyone else was following orders like sheep. Let us hope that more people will take a stand there with you. I totally agree with you.